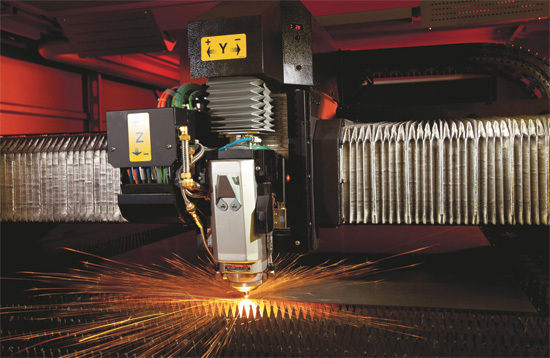 Amada’s FOL3015AJ fiber-laser cutting machine will interest showgoers by displaying what the company refers to as “unmatched speed while reducing operating costs and environmental waste.” This innovative machine reportedly is the world’s first 4000-W production fiber laser specifically designed for cutting. Combined with the high-speed cutting properties of Amada’s fiber resonator, the FOL-AJ quickly accelerates to the required cutting speed (maximum of 2360in./min.) or to the next contour to be processed. Also on display: Amada’s new HD NT press brake series, in bend lengths from 79 to 276 in. The brakes feature a hybrid drive system engineered for low energy consumption while reportedly requiring less hydraulic fluid than conventional machines.